Roy J. Carver (1909-1981) was an industrialist, sports enthusiast, and philanthropist whose generosity has made an indelible mark at the University of Iowa. Mr. Carver was the consummate entrepreneur founding three successful enterprises—Carver Pump Company, Carver Foundry Products, and Bandag Company. 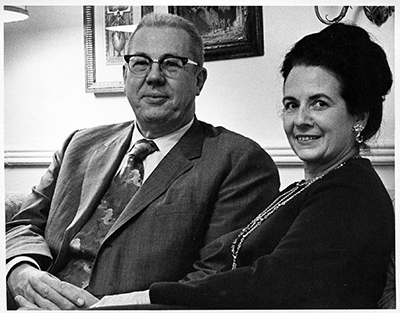 He and his wife Lucille became generous philanthropists supporting causes throughout Iowa and Illinois. Mr. Carver’s interest in medicine began as an undergraduate student at the University of Illinois. Although he graduated with a degree in engineering, he had a sincere desire to advance patient care and education in the health sciences. In 1978, the Carver Pavilion was dedicated at the University of Iowa Hospitals & Clinics thanks to Mr. Carver’s $2 million donation. Since that time, the Carver Trust has honored Mr. and Mrs. Carver with generous gifts to the University of Iowa resulting in the naming of the Roy J. and Lucille A. Carver College of Medicine and numerous faculty positions. The Carver name is now synonymous with the exceptional teaching and research associated with University of Iowa Hospitals & Clinics and the Carver College of Medicine. Their tremendous legacy of generosity will continue to impact Iowa’s students, residents, physicians, nurses, and caregivers for generations. Most important, their philanthropy positively impacts the lives of thousands of patients seeking care at the University of Iowa. Our gratitude for their support is immeasurable.